75 miles North of NYC (as the bike rides), cyclists and pedestrians now have their own Hudson River crossing. The Walkway Over the Hudson is a 24 foot wide, 1.2 mile long bridge that connects the city of Poughkeepsie with the Town of Lloyd. 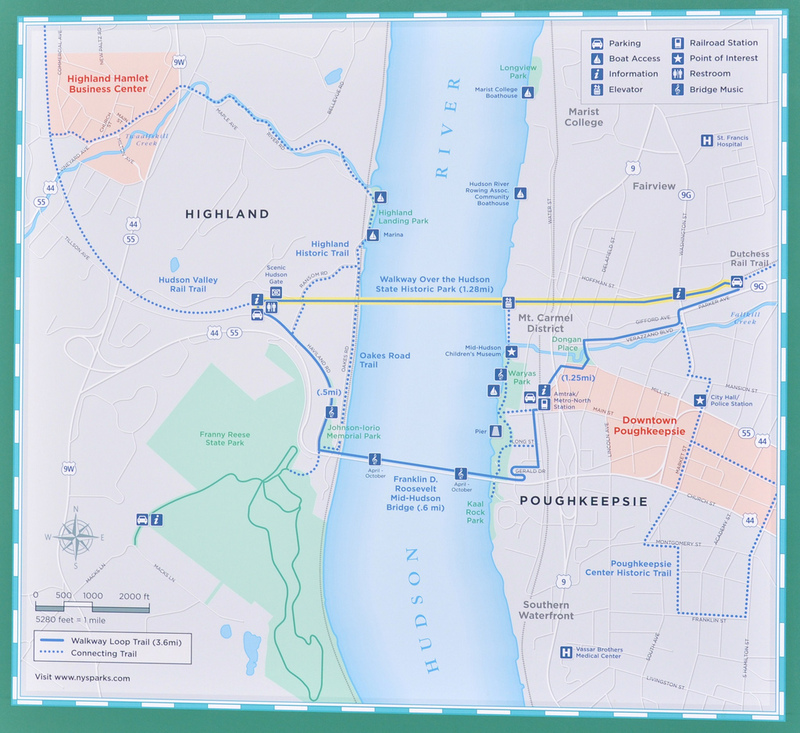 The Walkway Over the Hudson is less than a mile from the Poughkeepsie Metro North train station and open from 7am to sunset sunset, year-round, weather permitting. Where will access to the bridge be provided? Access will be provided on the west end of the bridge from Haviland Road and the adjoining rail trail. On the east of the bridge, access will be provided at Washington Street. In addition, work is being done to secure funds for an elevator to be located on the Poughkeepsie waterfront and near to the Poughkeepsie railroad station. The bridge spans the Hudson River and connects the City of Poughkeepsie in Dutchess County with the Town of Lloyd in Ulster County, New York. Will the bridge connect to trails on both sides of the river? The bridge will connect to 27 miles of rail trails and riverfront parks already built or planned in Ulster and Dutchess Counties.